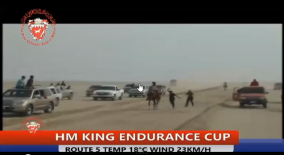 Bahrainian endurance rider Sh. Mohammed Bin Mubarak has been issued an FEI yellow card after an incident captured on video at the Sakhir CEI** (Bahrain). The Fédération Equestre Internationale has issued Bahrainian endurance rider Sh. Mohammed Bin Mubarak a yellow warning card and fined him $560 after an issue recorded on video Feb. 8 at the Sakhir CEI** (Bahrain). In the video, recorded by the competition, Mubarak’s horse slows to a trot. The horse is then chased, and appears to be struck, by people on foot, and he resumes cantering. The horse and rider won the race. FEI endurance rules state that riders are forbidden from: “Being followed, preceded or accompanied on any part of the course by any bicycle, pedestrian or athlete not in the competition.” “Someone on course encouraging the horse(s) by any means whatsoever” is also forbidden.